ZooEasy Sheep Software - the ultimate management tool for raising and breeding sheep! 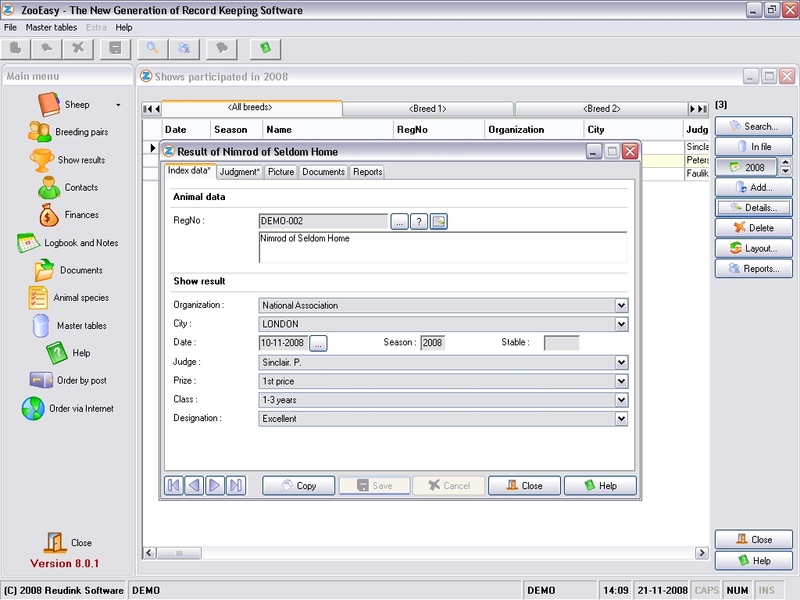 If you would like to create a professional digital register of your entire sheep flock, ZooEasy sheep software is the ideal computer program for you. Perfect for the creation of sheep pedigrees, conducting trial breedings and recording the characteristics and medical history of your sheep. ZooEasy sheep breeding software moreover facilitates responsible and healthy sheep breeding. ZooEasy Stand Alone is installed on your own pc. Would you prefer to work online? Click here. ZooEasy Sheep software is suitable for all those breeding, rearing and raising sheep, including all breeds. Used by members of sheep associations such as the American Sheep Industry, National Sheep Association and Canadian Sheep Breeders Association. Create a clear and professional overview of your sheep flock using ZooEasy sheep software. All characteristics and genetic information of your sheep such as names, titles, color, fleece, ear tags and birth data can be easily registered. Also measurements, weight development and blood relationships can be recorded with this program. Moreover, multiple digital pictures and documents can be added and detailed reports of your sheep data can be generated with a single mouse click. ZooEasy sheep breeding software helps to prevent inbreeding, allowing you to breed your sheep in a healthy and responsible manner. We have made it easy to select the best breeding pairs using relationship percentages and the calculation of inbreeding coefficients. Therefore, genetically healthy offspring can be ensured. You can also perform trial breeding by adding sheep from other sheep breeders. 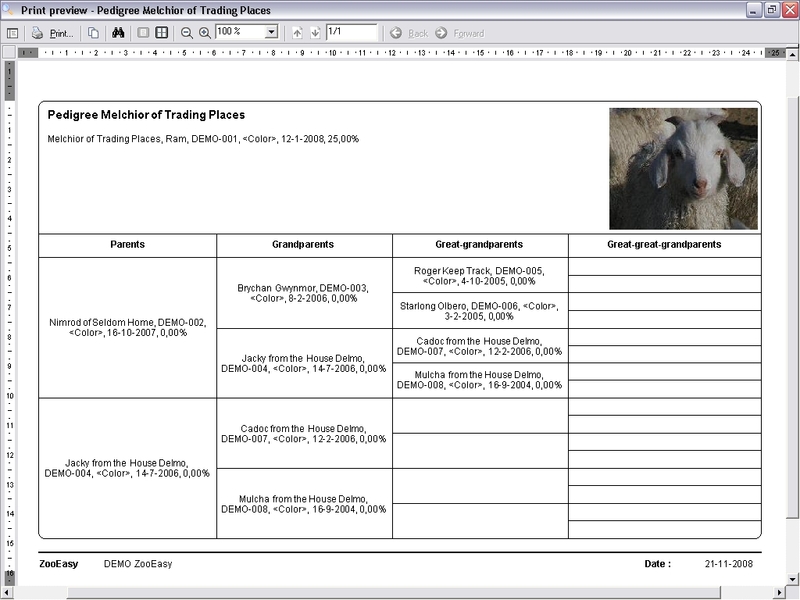 Create and print the finest pedigrees, including a picture and your own watermark or logo. ZooEasy sheep breeding software also allows you to record the medical history of your sheep, including vaccinations, veterinary checkups and test results. 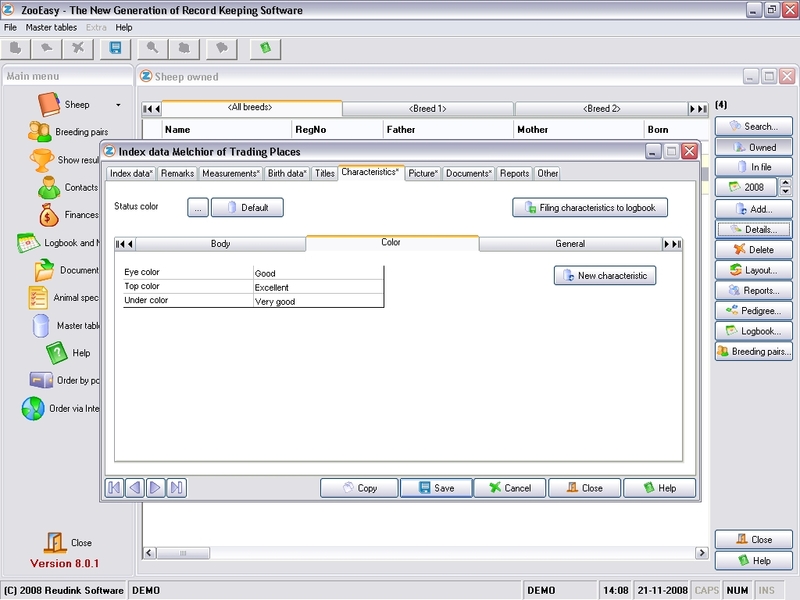 The programs clever search options and orderly sheep pedigrees can be used to select the best sheep for breeding based on, for example, health and appearance. Maintain a record of participation in sheep shows and the awards received by your flock. Also register the contact details of your customers, suppliers and other sheep breeders to keep an up-to-date network of contacts. 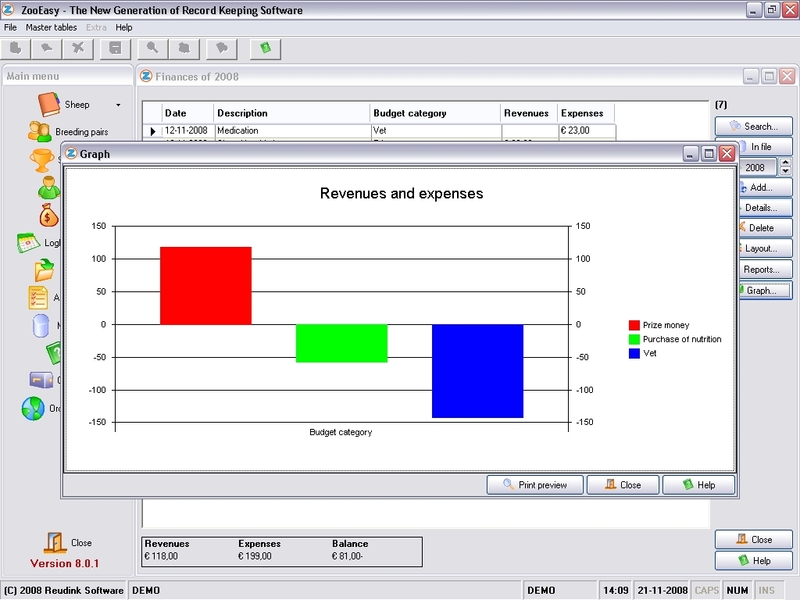 With ZooEasy sheep software it is also possible to keep an eye on the expenses and revenues of your sheep hobby, including for instance the purchase and sale of sheep. ZooEasy currently serves over 12,000 clients worldwide and is well-established in the sheep breeding industry. ZooEasy sheep software is used by many individual sheep breeders and owners but also by petting zoos, sheep associations and clubs. ZooEasy is known for excellent product support and outstanding service. 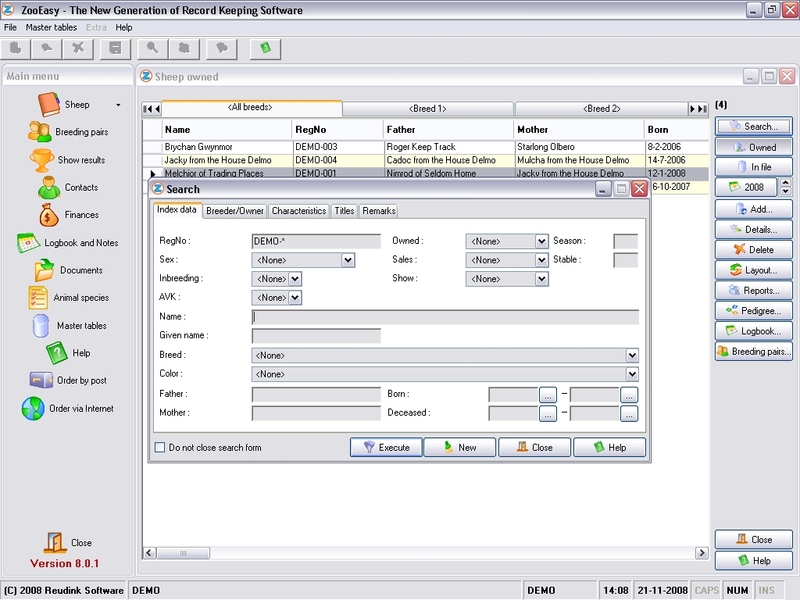 With a professional helpdesk and easy to use manual, sheep breeding software could not be made easier. 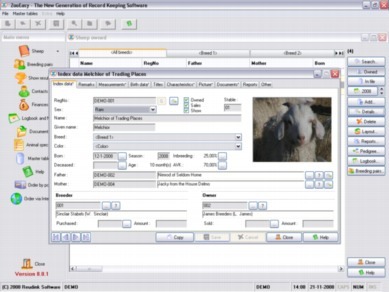 ZooEasy sheep software is easy to use and allows you to develop a complete digital record of your entire flock. 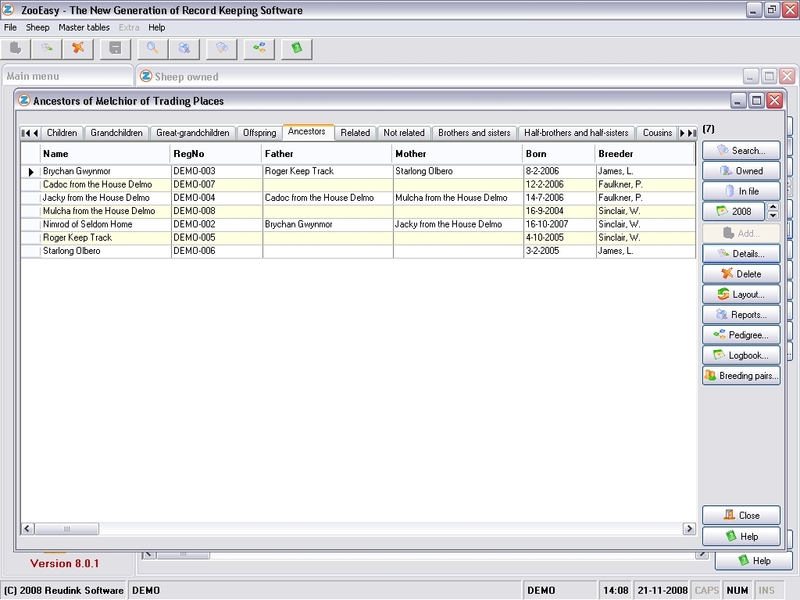 Sheep pedigrees and all data related to your sheep are registered together in one orderly database. This user-friendly program is an indispensable aid for all those breeding, raising and rearing sheep. 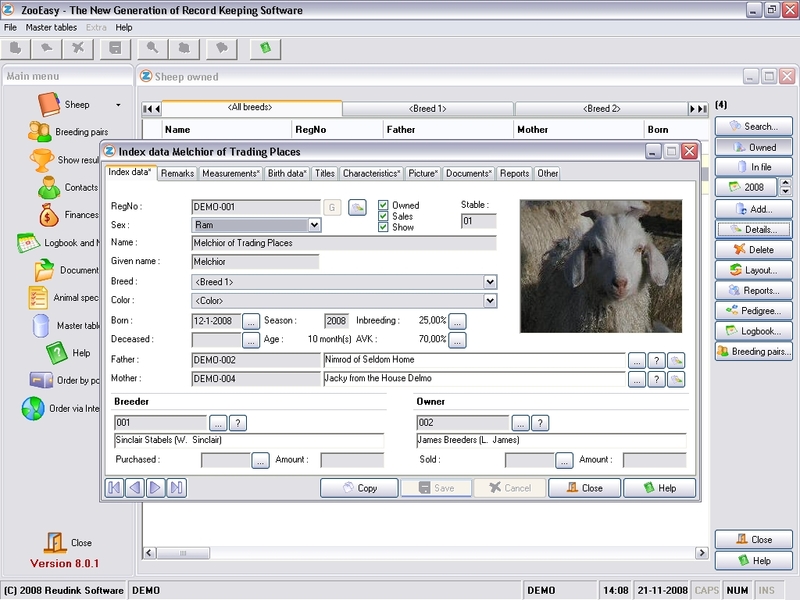 ZooEasy sheep software is suitable for all sheep breeds. ZooEasy sheep software is available in CD-Rom and download version. Both can be ordered online in 5 simple steps by clicking here. Please do not hesitate to contact the ZooEasy helpdesk or call us at +31 (0)85 303 29 90 if you have any further questions.